PORT HUENEME, Calif.- “We Build, We Fight” has been the motto of the U. S. Navy’s Construction Force, known as the “Seabees”, for the past 75 years. Las Cruces, New Mexico native and Onate High School graduate, Petty Officer 2nd Class Miguel Holguin, builds and fights around the world as a member of a naval construction battalion center located in Port Hueneme, California. Holguin works as an engineering aide in the Navy. “I do computer drafting, soil analysis and surveying for construction sites,” said Holguin. “I like that I get be the first one out on the project,” said Holguin "I enjoy the travel. For example, I've been to Greece, the Philippines and Japan." "Seabees deploy around the world providing expert expeditionary construction support on land and under the sea, for the Navy and Marine Corps, in war, humanitarian crisis and peace," said Capt. Mike Saum, commodore, Naval Construction Group (NCG) 1. "Seabee resiliency, skill, and resolution under hostile and rough conditions prove our motto 'We Build, We Fight.' The Seabee patch we wear on our uniform signifies to the warfighter and civilian alike that they're in good hands." 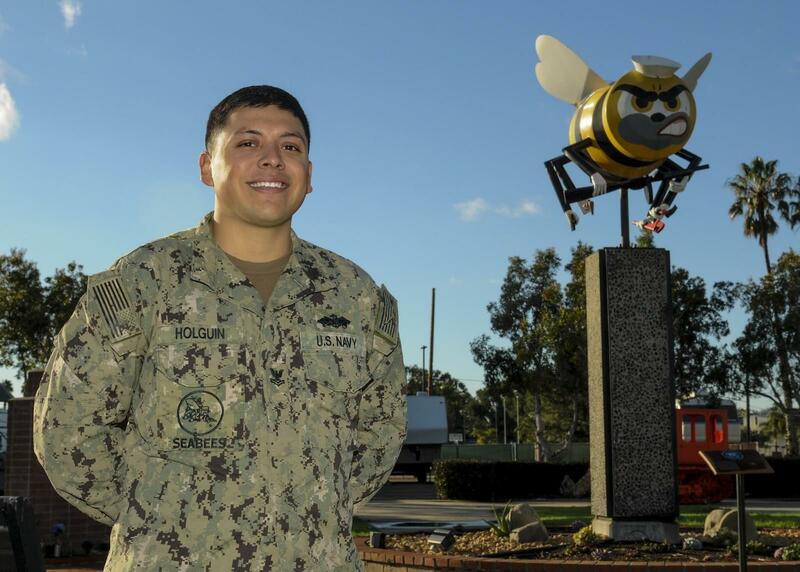 Serving in the U.S. Navy has allowed Holguin to continue learning about himself and the legacy he wants to leave to future Seabees. “It's nice to be part of history with the Seabees,” said Holguin. "A lot of people don't know what we do, so celebrating our 75th year gives us the opportunity to share what we do. It's something I'll always remember."